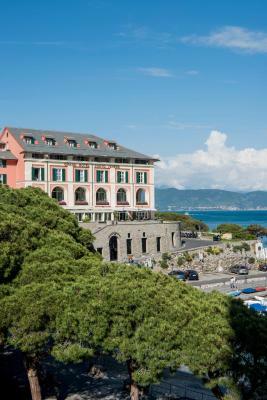 Lock in a great price for Grand Hotel Portovenere – rated 9 by recent guests! Everything was perfect. 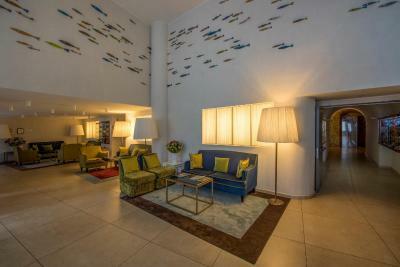 Service, quality of room, food and location 10+. Looking forward to coming back. Location was absolutely perfect. Views were breathtaking! You must reserve a room with a view!! Breakfast assortment surpassed our expectations! Front staff was very welcoming and accommodating! Nice touches like including a water bottle with our beach towels! High end toiletries! The check out time was at noon time and the kids wanted to swim in the afternoon. The hotel manager gave us a courtesy room to get changed and have shower after our swim which was very nice! The room is nice and spacious, breakfast was amazing and service is outstanding. We will come back. Beautiful property overlooking the port and walking distance from all attractions. Modern , comfortable rooms. Outstanding service. Special mention to Paulo and Valeria at the reception desk who were amazing to cater to all our needs. For sure we will return ! This hotel and location were absolutely amazing. The view from our room was of the courtyard which was nice, but we didn't really spend much time there. Everything was an easy walk away and the ferry to Cinque Terre is right outside which was so convenient. This was our favorite stop on the trip by far. Will definitely be coming back here some day! Very cheerful and helpful staff. Ideal location. Decent parking facility. Nicely decorated, if a bit generic. The hotel is situated with a wonderful view of the bay! Portovenere is beautiful and the buildings look very much like Cinque Terra which we were there to visit. Staff was excellent. Buffet breakfast which was included was delicious! The location for accessing the Cinque Terre is fantastic, boat is right next door and a bus goes into La Spezia every half hour to catch the train. All Hotel staff were wonderful and service very good. I had a sea view room and it was one of the best views in the area. 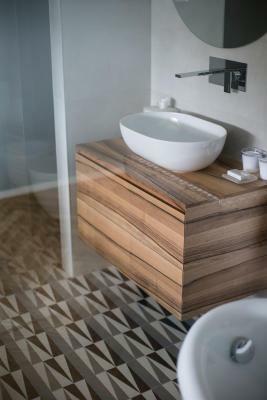 Toiltetries in room were the best I have ever had. Breakfast is taken on the terrace and what a way to start the day. Front office staff very professional and helpful Would definately recommend staying here if you can. Excellent location and very attentive and friendly staff! Restaurant suggestions were outstanding! 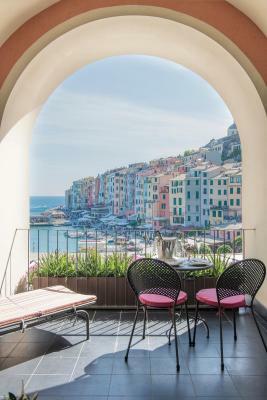 Grand Hotel Portovenere This rating is a reflection of how the property compares to the industry standard when it comes to price, facilities and services available. It's based on a self-evaluation by the property. Use this rating to help choose your stay! 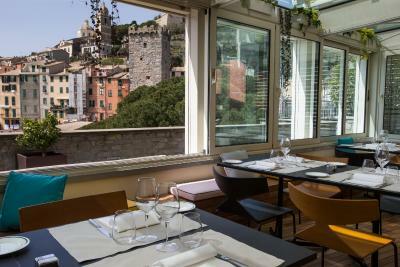 Set on Portovenere's seafront, this hotel features a terrace overlooking the small port and Palmaria Island. Set in a 17th-century monastery, it is a few steps from the town center. The air-conditioned rooms include free WiFi, LED TV with free Sky channels and mini-bar, some offer sea views. 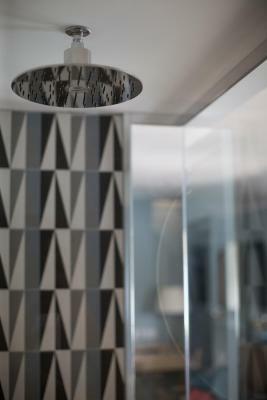 The private bathroom includes a bath or shower, hairdryer and free toiletries. 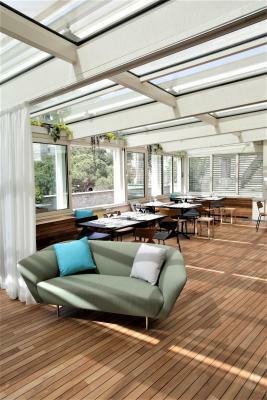 A buffet breakfast can be enjoyed on the panoramic terrace. 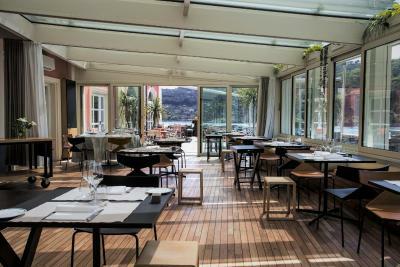 The restaurant serves fresh fish and specialties from the Cinque Terre. Private boat tours can be arranged on request. 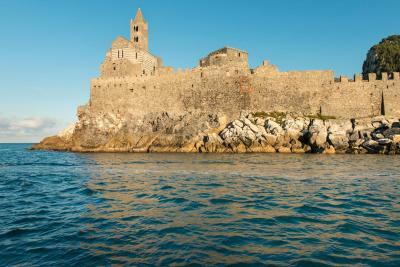 This is our guests' favorite part of Portovenere, according to independent reviews. 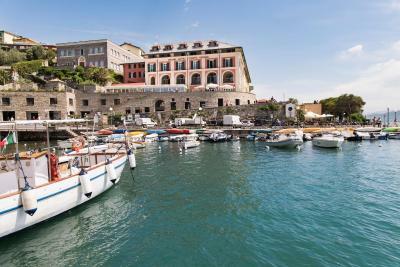 This property also has one of the top-rated locations in Portovenere! Guests are happier about it compared to other properties in the area. 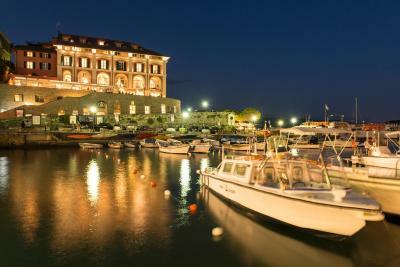 When would you like to stay at Grand Hotel Portovenere? 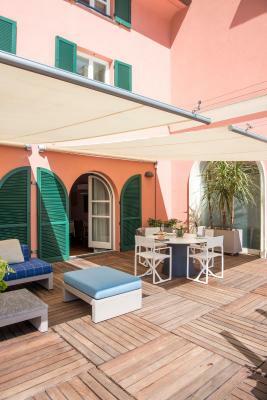 Classic-style room with views of the Ligurian Sea, air conditioning, satellite TV and mini-bar. Spacious room with separate seating area and views of Palmaria Island. 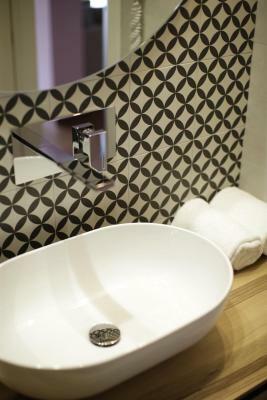 The bathroom is made of marble and includes a hairdryer and free toiletries. 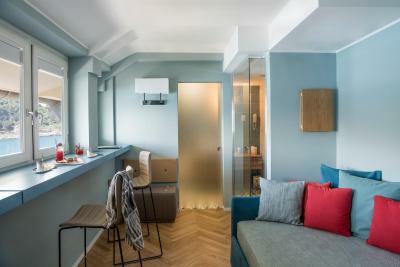 This room can accommodate 1 extra bed at a surcharge of EUR 100 and upon confirmation by the property. This air-conditioned room overlooks the courtyard and comes with a mini-bar and satellite TV. The private bathroom includes a hairdryer and free toiletries. This bright corner room offers views over the gulf. 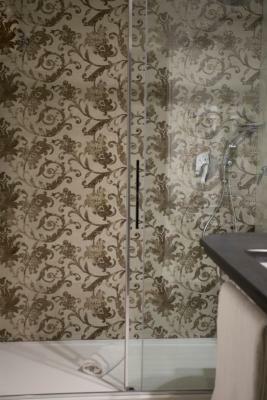 The private marble bathroom comes with a bath or shower. 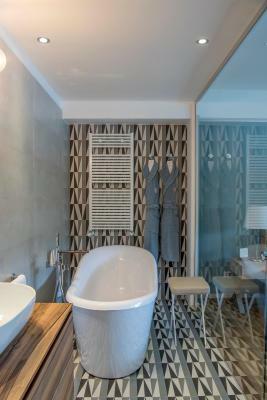 House Rules Grand Hotel Portovenere takes special requests – add in the next step! Grand Hotel Portovenere accepts these cards and reserves the right to temporarily hold an amount prior to arrival. Please note that the wellness center is subject to additional costs. Described as a suite but room is small ( with beautiful view ). Bathroom tiny prefabricated. Breakfast less than fair with a limited offering. No fruit or vegetables. Although the location is excellent the hotel itself could use a lift. Not worth $ 700 per night. I didn’t like that I couldn’t stay longer. We had to leave after only 2 nights but could have stayed much longer.....! The hotel was very stylish and absolutely spotless. We have travelled extensively but the entire staff were by far the most engaging and pleasant we've encountered. To cap it all, the food is exceptional - a real treat. You will not be disappointed! This hotel is in a stunning location, with beautiful views from the premium sea view rooms. The hotel staff were knowledgeable and friendly. We enjoyed a delicious dinner at the hotels restaurant Palmaria with an excellent selection of wines and also they had non alcoholic beer. It is worth spending the extra money to stay here and we would highly recommend. Great hotel. Lovely staff very friendly and helpful. Couldn’t have chosen a better location or hotel. Std rooms are narrow. Bath cosmetic is not premium. Nice location and beatiful view. Parking was provided. At the same time it's not big chain hotel and not a small cozy place, something in btw. The breakfast was unbelievable!! The staff were very friendly and always willing to answer any questions and give great travel advice. Beautiful hotel, comfortable , best location, staff better than excellent.